From L to R: Consul a.h. of Azerbaijan in the Philippines Jose De Venecia III, Counsellor Ruslan Nasibov, Ambassador Tamerlan Garayev DTI Secretary Ramon Lopez, Undersecretary Nora Terrado, Director Ann Cabochan, and Director Angelica Cayas. 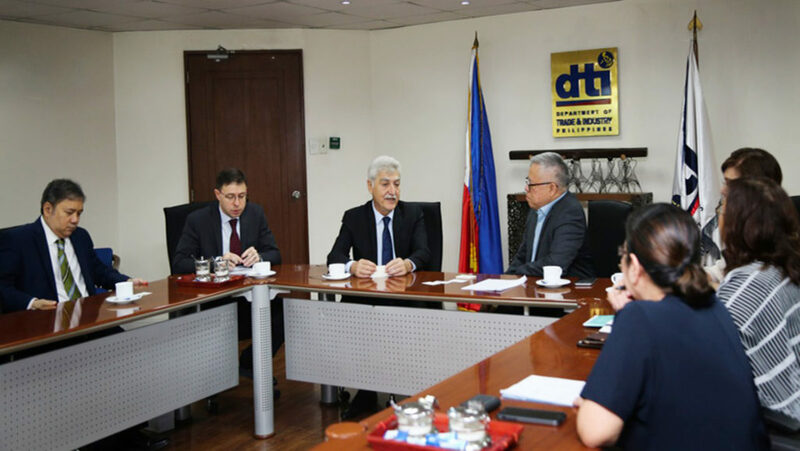 MAKATI—Trade and Industry Secretary Ramon M. Lopez met with Azerbaijan Ambassador Tamerlan Garayev last 31 May to discuss trade opportunities between Azerbaijan (AZ) and the Philippines (PH). “Our meeting with Consul Garayev is part of President Rodrigo Duterte’s strategy to seek out non-traditional trading partners. We see a lot complementation between our countries,” said Sec. Lopez. PH is keen on exporting tropical fruits, like bananas and mangoes, to AZ. Exporting to the Eurasian country is also a boon for PH’s Halal industry, since its population is predominantly Muslim. “Your country is famous for its mangoes,” said the Azerbaijan Ambassador who cited Jose Rizal as his childhood hero. Meanwhile, PH sees AZ as an alternative source of fuel since oil and natural gas account for around 90 percent of Azerbaijan’s total exports. The country is also a transport hub for exports since it’s located near Georgia, Turkmenistan, Kazakhstan, Iran, Turkey, Bulgaria, Romania, and Ukraine. With only a 10M population and a 6.2% Gross Domestic Product (GDP), Ambassador Garayev said that his country needs more manpower for its tourism and agriculture industries. Since there are only 300 Filipinos in AZ, Sec. Lopez suggested that Filipinos fill these vacancies. Both countries want to mutually develop education and tourism by having student/ teacher exchange programs and tourism promotions. The two countries will form a Joint Economic Commission to further these talks beginning with possible government to government transactions. Current trade balance between PH and AZ is in favor of PH due to exports of the following: electronics; electrical and electronic machinery; almonds, fresh or dried, shelled. Azerbaijan is PH’s 172nd trading partner (out of 223), and 153rd export market (out of 216), and 171st import source (out of 198). 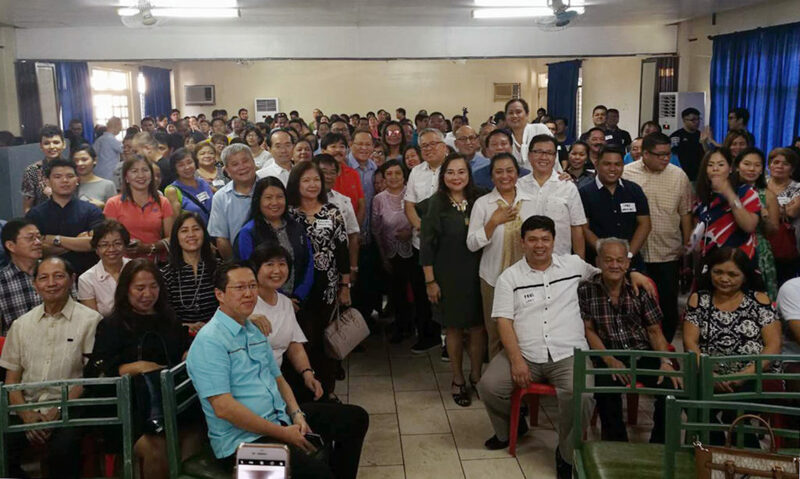 MARIKINA – Department of Trade and Industry (DTI) Secretary Ramon Lopez led the inauguration of the expanded Shared Service Facility (SSF) on high value custom-made footwear which features advanced technology and newly acquired state-of-the-art machineries in preparing customized footwear molds that would increase productivity of shoemakers. Department of Trade and Industry (DTI) Regional Director Asteria Caberte warns unscrupulous business establishments that are taking advantage of credit card holders by imposing surcharges. Caberte revealed the illicit tactics of some business establishments that are imposing additional charges on items purchased through credit cards of unsuspecting buyers who are not aware that these surcharges are illegal. “All retailers who accept credit cards for payment should not require the cardholders to pay additional charge over and above the price tag on the consumer goods and services,” Caberte said. Under Article 81, or the “Price Tag Requirement,” of Republic Act 7394, otherwise known as “Consumer Act of the Philippines,” goods and services must have only an appropriate price tag or label. It must not be sold at a higher price that what is stated and without discrimination to all buyers. Caberte also advised consumers who were tricked into paying the surcharges to ask for a refund and report the incident to the Department of Trade and Industry (DTI). 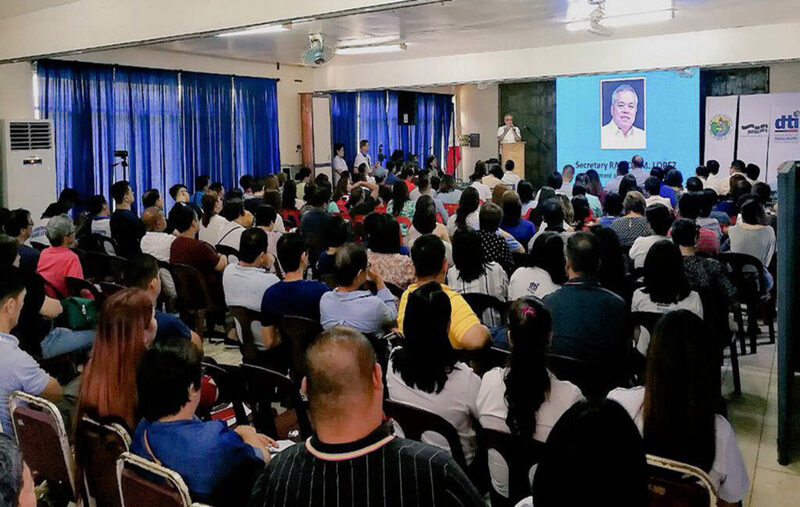 Caberte warned violators that DTI is regularly monitoring business establishments to ensure that consumer rights are upheld. Caberte underscored that unscrupulous retailers will be fined depending on the gravity, and/or revocation of their business permit and license. For complaints and questions, one may call or visit the Consumer Protection Division at the following DTI’ provincial offices: BOHOL PROVINCIAL OFFICE, 2F FCB Bldg., CPG Ave., Tagbilaran City. Tel. # (63) 038-501-8260; CEBU PROVINCIAL OFFICE, DTI Building, Osmena Boulevard, corner Lapulapu Street, Cebu City, Tel. # (63)(032) 255-6971 / 255-3926 . (63)(032) 412-1944 / 412-1945;SIQUIJOR PROVINCIAL OFFICE. CF Bldg., Legaspi St., Siquijor, Siquijor, Tel. # (63)035-480-9065 ; NEGROS ORIENTAL PROVINCIAL OFFICE, 2F Uymatiao Bldg., San Jose Street. Dumaguete City Tel. # (63)(035) 422-2764. In line with the celebration of Design Week Philippines, the Department of Trade and Industry’s Design Center of the Philippines (DTI-Design Center) partners with key organizations and events all over the Metro Manila in its aim to gather the creative community and support the advancement of the creative services sector of the country. With the tagline “Design Tribes,” Design Week Philippines kicked off last 14 April 2018 in Intramuros and will run until 22 April 2018. “Building connections and communities has always been at the core of Design Week Philippines,” said DTI Design Center Executive Director Rhea O. Matute. “This is why we create a movement by engaging partners and partner events to show the diverse ways of celebrating Design Week Philippines, and eventually make design and creativity a way of life in the Philippines,” she added. Design Center has established collaboration with 41 partners, 32 events in 16 venues all over the Metro Manila. Matute emphasized that partnerships help amplify and promote new destinations and hubs that can play significant roles in enabling communities, especially the youth. Design Week Philippines promises a nine-day of borderless creative festivity with series of design talks, design tours, hands-on workshops, exhibitions, art booths, live performances, outdoor film showing, weekend market and a lot more that will ensure participants’ and visitors’ engagement in design and creativity. In previous editions, Design Week Philippines launched the historical Walled City of Intramuros as a creative environment, and has since supported the Intramuros Administration in its initiatives to revive it. Design Week also taps the district as a home for its event components such as Design Talks, Design Tours and Creative Workshops to revitalize the historical and cultural assets of the environment and inject it with creative endeavors to encourage development of new ideas. For this edition, Design Week is working with the National Commission of Culture and the Arts (NCCA) in mounting several hands-on creative workshops and art booths for everyone in Plaza Moriones in Intramuros, Manila. Scheduled on 21 April 2018, workshops for the following are open for everyone: Poetry Making, Smartphone Film Making, Kite Making and Kite Flying Activity, and Face Painting. Meanwhile, on the 22nd April, a Travel Journaling workshop with Abbey Sy is scheduled. The iMake History exhibit features scale models of iconic landmarks within the walls of Intramuros made with Legos. Formerly accessible only to the Limtuaco family’s friends and guests, Destileria Limtuaco, the oldest distillery in the Philippines, opens it museum to the public. It partners with Manila FAME happening at the World Trade Center from 19-21 April; Nesta’s Creative Enterprise Programme with British Council of the Philippines on 17-19 April; Hollowblock Presents: OTTOMONDI with Pineapple Lab, 14 April 2018, Pineapple Lab; Glug Creative Socials with ASpace on 18 April 2018; EUREKA SERIES: POBLACION RE-IMAGINED on 19 April 2018 with Acceler8 Coworking; and South Arts Festival on 22 April 2018. Design Week also partnered with 98B COLLABoratory, situated in Escolta, a neighboring district of Intramuros, for its Future Market. With its goal of putting soul and spirit into commerce, the Future Market caters to creative individuals and artists to sustain their art practice and to experimenting startups and entrepreneurs to enable them to practice and transition towards a more stable and sustainable commercial setting. For the complete list of partner events and details on Design Week, follow DTI – Design Center of the Philippines’ Facebook page.